We may well have missed including Antony House on our West Country travels had Alice in Wonderland not let us in on the secret of this National Trust property. Antony House was they key location for the filming of Alice in Wonderland in September 2008 and Johnny Depp’s famous Mad Hatter’s tea party was set in the gardens. At that time Antony House and Torpoint achieved overnight fame with Depp fans hoping to catch a glimpse of this Holywood heartthrob. But Depp himself never really came to Cornwall – although some fans, so hyped up with excitement, claim to have seen him landing by helicopter! Just in case you don’t know where the Mad Hatter’s tea party was held, Antony House is in Torpoint, a town on the East Cornwall peninsula, just across the River Tamar from Plymouth. Antony House was built between 1711-1721 for Sir William Carew, whose family owned the estate since 1492. This 18th century mansion is nestled in parkland bounded by the estuaries of the Tamar and Lynher Rivers to the east and north and by the sea to the south. This historic National Trust property consists of a central two-storey block faced with silver-grey stone and two brick wings joined by colonades. Unlike many country houses Antony House was spared the modernisation of the Victorian period. Apart from the addition of a 19th century porch the house has not been altered since. Explore the interior of the house and you’ll see the exceptional quality of its furnishings. The rooms are panelled in Dutch oak and some still contain the original 18th century furniture. They also display some fine china, tapestries, embroideries and many interesting portraits. Generations of the Carew family lived on the estate before Antony House was built. The paintings and treasures in Antony House today have been collected over a period of almost 600 years. The splendid collection of portraits includes work by Reynolds and a painting of Charles I at his trial. Look out for the portrait of Richard Carew who faces Charles I across the entrance hall. Richard Carew was a historian and author of the ‘Survey of Cornwall’ – he inherited the estate in 1564. Antony’s superb 25 acre landscaped garden is partly the work of Humphry Repton (one of the great landscape gardeners) who swept away the formal parterres to the north of the house in the late 18th century. The topiary and yew hedges are the work Hon. Reginald Pole Carew who redesigned the garden in 1800. The lawns sweep down to the River Tamar and there are many species of indigenous and exotic trees and a collection of camellias, azaleas, rhododendrons, magnolias and other flowering shrubs. The gardens contain a collection of stone carvings from the North West Frontier of India and a temple bell from Burma brought back to Antony House by General Sir Reginald Pole-Carew. There is also a natural woodland of 50 acres bordering the estuary of the River Lynher. 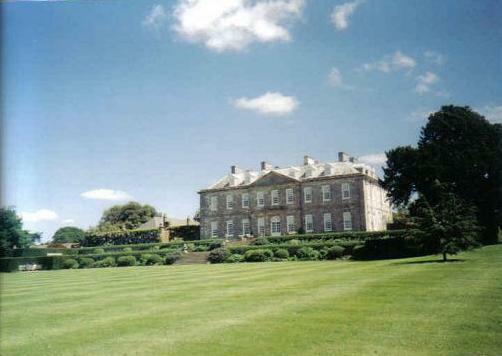 Antony House was given to the National Trust in 1961 by Sir John Carew-Pole. The gardens are in the care of Carew-Pole Garden Trust. The ‘Alice’ Meets Antony Exhibition at Antony House tells the story of Antony’s transformation during the filming of Disney’s Alice in Wonderland. On weekends and bank holidays, children of all ages can take part in the Mad Hatter’s tea party which includes dressing up, music, workshops and games. (Call 01752 812 191 if you’d like to book a place at the tea party.) The National Trust has hopes that the movie will boost visitors numbers from 25,000 to 65,000 this year. Our visit will hopefully contribute to achieving the desired visitor increase of 40,000. We went there while the Alice set was still on. It was a lovely experience. The property is amazing and well maintained by National Trust. If you are visiting Devon/Cornwall, then do go here.